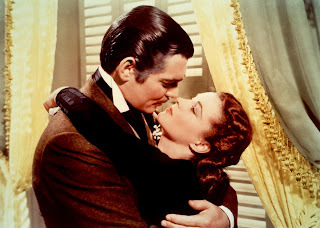 Just go to box office mojo and sort the biggest box office films of all time by inflation adjusted numbers and you’ll see Gone With the Wind is still the highest grossing movie of all time ($1.4 billion). All the greater achievement knowing producer David O. Selznick concertedly sought to make the biggest and greatest picture of all time. Selznick’s adaptation of Margaret Mitchell’s book created a cinematic template for sweeping romantic epics, that is pitting the individual conflicts of its characters amongst in the context of far-reaching and monumental historical conflicts. Mitchell’s hero is a naïve young southern Belle, Scarlett O’Hara. As a young girl from a well off, but self-made Irish immigrant father, she’s only seen the spoils of the Old South living on an expansive and romantic cotton plantation called ‘Tara’. It doesn’t take long for the story to send O’Hara’s blissful life into despair when her one love in the world, Ashley Wilkes (Leslie Howard), announces an engagement to Scarlett’s cousin Melanie (Olivia De Havilland). Scarlett whines and pouts and decides to hastily marry local dweeb Charles Hamilton on a whim and move to Atlanta. Meanwhile Scarlett continually crosses paths and flirts with dashing Rhett Butler (Clark Gable) – a charming southern gentleman, aristocrat and career-bachelor. When the Civil War arrives Scarlett’s decadent lifestyle comes to a violent end. Hamilton is killed in battle and the city of Atlanta is burnt to the ground by the invading Yankees. Scarlett retreats to her beloved Tara only to realize that it too has been decimated by war. And so, at her lowest moment Scarlett shouts to the world and to us, the audience, ‘if I have to lie, steal, cheat or kill. As God is my witness, I'll never be hungry again.’ Indeed Scarlett adapts to the new realities of the Old South, picks herself up, becomes an independent entrepreneur and rebuilds Tara. She even resorts to marrying Rhett Butler in order to reclaim her status and wealth. Unfortunately with her forlorn love for Ashley Wilkes still kindling her relationship with Butler becomes poisoned resulting in tragedy as dramatic as the war she overcame. Under the pen of screenwriter Sidney Howard and ultimately under Selznick’s watchful eye the character of Scarlett O’Hara is never trumped by the pyrotechnics and spectacle. Over the nearly 4 hours running time, Scarlett’s motivations and goals always remain consistent. And after all the obstacles put in front of her she emerges with a remarkably precise and clearly defined character arc with as much dramatic gravitas as any character ever put to screen. Structurally, the emotional place of her character is visualized succinctly by one shot repeated three times throughout the picture – the definitive image of the film, the sundrenched landscape vista showing framing Scarlett underneath a tree with the Tara estate in the background. In the opening, Scarlett, young and naïve, is with her father being told of the intrinsic value of land; at the midpoint, when Scarlett has returned to her home destitute and penniless, underneath the same tree, though now leafless and naked, she loudly proclaims her desire to ‘never starve again’; and then in the end after her child has died and Rhett has left her she retreats to Tara, her only true unconditional form of love – her home. In between these benchmarks, a number of memorable characters and set pieces elevate the material to Hollywood entertainment of the highest order. Of course, Gable as Rhett Butler is iconic, a role cast by the demand of the people at the time. His elusive charm and bad boy enigma is a guide for all on-screen rebels. Hattie McDaniel, the first black person to win an Oscar, is so supremely lovable as Scarlett’s loyal housemaid. Under the producer-driven studio machine, Selznick achieves ‘epicness’ with a number of astonishing set pieces aided by the great William Cameron Menzies phenomenal production design; The ballroom dance sequence is of course a revered classic, but set up with great tension when Rhett controversially announces to the crowd he wants to take Scarlett’s hand in the dance; the tragedy of the Civil War is visualized in one magnificent epic shot when the camera, following Scarlett, pulls back to reveal the railyard littered with dead soldiers; the burning of Atlanta sequence uses the best matte photography effects, and the final emotional moments between Rhett and Scarlett at her fog hazed doorway oozes melodrama.